Kidney stones make up the majority of stone disease in the UK but bladder stones still occur. They occur most commonly in the 20-50 age range, but can affect any age group. Men are affected more commonly than women, with a ratio of 3:1. They are more common in the summer. In the UK 1 in 10 will suffer with a kidney stone by the age of 70. Most stones are formed of calcium combined with other chemicals, most commonly phosphate and oxalate. Most stones contain calcium making them visible by normal x-rays, the amount dictates the degree of visibility, up to 20% of uric acid stone contain some calcium oxalate. Stones form when the concentrations of the constituents rise above the level at which they are able to dissolve in the urine. Crystals form around a nucleus and aggregate into clumps. Most kidney stones are able to travel from the kidney down the ureter (the tube that joins the kidney to the bladder) to the bladder. They may cause pain known as “Renal Colic”, characteristically this is a pain that starts in the back and travels down into the groin and comes in waves. This tends to occur when a stone is moving down the ureter. Many stones may not cause symptoms if they remain in the kidney. Kidney stones may be a cause of blood in the urine and recurrent urine infections. 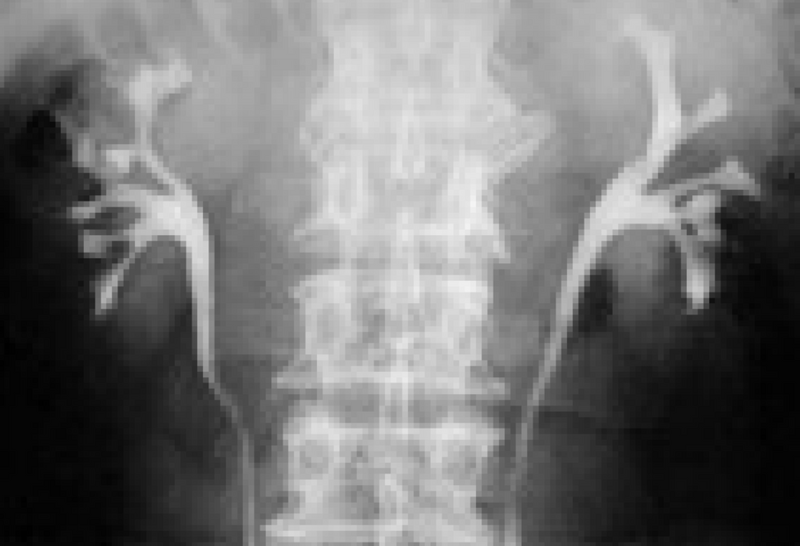 Most stones are visible on a plain x-ray, known as a KUB. Sometimes an injection of “dye” is given before the x-ray which highlights the kidney and drainage system making it easier to identify a stone, this test is known as an IVU or IVP. The use of CT scans is becoming more common as it is very good at detecting stones and does not require an injection. The majority of stones that cause symptoms by passing down the ureter, do not require surgical treatment. 85% of stones less than 4mm will pass spontaneously. Medicines can be given to relieve pain and help with the passage of the stone. Stones within the kidney, can be treated with shockwaves generated by a machine. This is known as Extracorporeal Shock Wave Lithotripsy (ESWL). The patient lies on a special couch and the machine is placed against the back. Treatments may last for up to 1 hour, patients may require pain killers during the procedure. The number of treatments required depend on the size, type and number of stones. Some patients require the placement of a ureteric stent before treatment, this is a plastic tube running from the kidney to the bladder placed under a short general anaesthetic. Stones may require surgical removal. This is usually performed endoscopically, using a rigid or flexible camera passed via the bladder to the stone (Ureteroscopy). Stones may then be removed intact with a basket or broken up into fragments with a laser or shockwave machine. Larger stones in the kidney may need to be removed by a “keyhole” technique with a direct puncture into the kidney, this is known as Percutaneous Nephrolithotomy (PCNL). All of these treatments are available through West Sussex Urology.